I enjoyed this novel; it’s well-written and quite clever. I was, however, expecting to like it a lot more. I actually think it is because the termStepford Wife has become fairly common, and in 2013 it’s impossible to start reading this book without knowing how it is going to end. Joanna Eberhart and her husband have just moved to a seemingly perfect little town called Stepford. As Joanna begins to meet her new neighbors, she notices that every one of the women are flawless in appearance and obsessed with keeping their homes clean and their husbands happy. Joanna, who works as a freelance photographer, finds it hard to relate to these women, and finally befriends Bobbie, the one other local woman who is baffled by the women of Stepford. However, after a weekend alone with her husband, Bobbie does a complete turnaround and begins obsessing over housework. Joanna slowly comes to the realization that it is only a matter of time until she, too, is changed by the Stepford men. Not wanting to lose herself, she tries to run away, but it is too late. The idea of replacing wives with docile, robotic cleaning machines is completely terrifying. At times, it seems like Levin is playing to a fantasy long held by men regarding how wives should behave. On the other hand, though, he seems to be mocking that very fantasy through the ridiculous nature of the recreated wives. Joanna is a pretty strong woman; she has a life outside of her husband and her children, which was still a relatively new concept for many people in the early ‘70s. 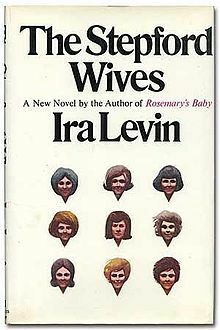 Perhaps Ira Levin was attempting to create an in-depth discussion of feminism, or maybe he was just trying to poke around at the subject and get people worked up a little. The Stepford Wives is a great book and a quick read. Knowing the ending may have caused me even more anxiety as I approached the unavoidable conclusion; Joanna is destined to become everything that she is against in women, and knowing that her struggle is fruitless makes her destiny that much worse.